It’s hard to believe today is December 1st! I, for one, am looking forward to the holidays & all the fun activities they bring (even though it means the snow will hit us soon). My parents finally made it to New York from Oregon and we are already having so much fun – I know the next 6 weeks will be full of sweet moments that I will cherish for years to come & I’m feeling so grateful that we get to have this time with them. Macy’s Friends & Family Sale: extra 30% off on select styles & an extra 15% off beauty using code FRIEND – I shared a review of this coat on my Instastories & it is probably one of my favorite purchases as of late. It’s still a splurge at the sale price, but worth every penny in my opinion (note: the color is more red in person and I recommend sizing down). Bloomingdale’s Friends & Family Sale: extra 25% off on select styles using code FRIENDS + free shipping on all orders – love the detail on this sweater, this velvet top & these pearl earrings (only $8!!). Lord & Taylor Friends & Family Sale: extra 30% off almost everything & an extra 15% off almost all beauty using code FRIENDS – so many amazing deals including this cable knit sweater, this patterned coat & these suede boots. LOFT: 40% off select tops & sweaters and an extra 50% off all sale styles – they have tons of new arrivals worth checking out like this cable knit sweater, this velvet top (love the color!) & this cozy pullover. Banana Republic: 40% off your purchase + an extra 20% off sweaters today only (discount taken at checkout) – I’m eyeing this ruffled crewneck, this ribbed cardigan & this bow-cuff sweater (comes in 11 colors & is only $37!). Beautiful things … great findings! ♥️??♥️?? Kimberly, I love all of these options! 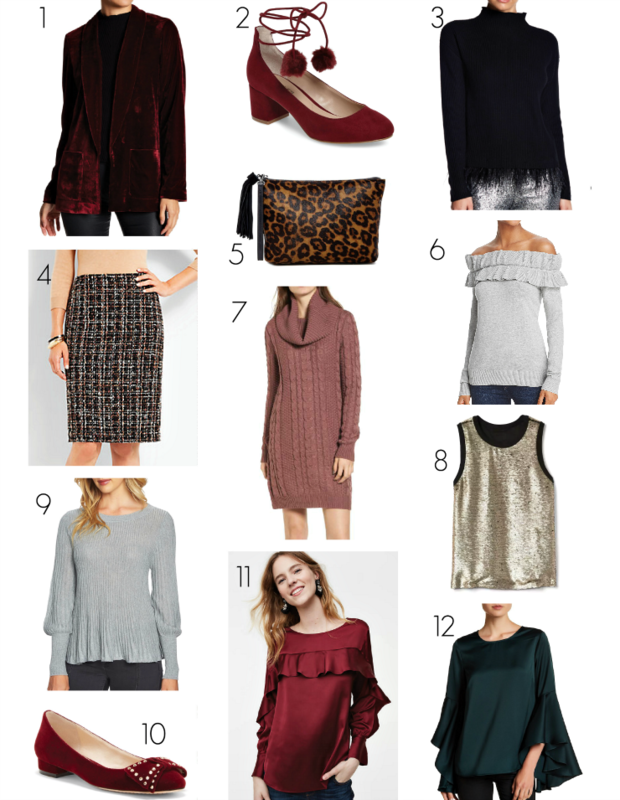 (I’m obsessed with a ruffled sweater these days!) Thanks, as always, for your round ups! I’ve been reading the blog for YEARS, but rarely comment. Haha, I must do better! Oh thank you so much – I appreciate you taking the time to comment! !